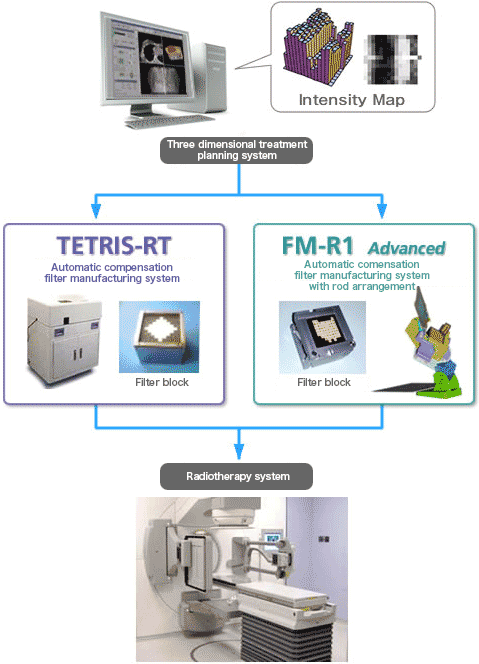 Based on the block arrangement defined during therapy planning, a compensation filter is automatically manufactured and installed in the Linac system to facilitate IMRT. 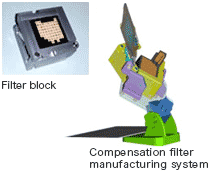 The compensation filter is manufactured from rod-formed material and installed in the Linac system to facilitate IMRT that requires a particular dose profile. Complex MLC movement is avoided to provide high-precision IMRT by assuring a beam intensity with the block filter. Rectangular field radiation eliminates intermittent sequences, resulting in a 60% shorter IMRT treatment time. The manufacturing system is equipped with an arrangement check function that avoids arrangement errors. The block materials are reusable, thereby avoiding the production of clinical waste.